3D Design Software – VRClay + Oculus Rift Makes Our Eyeballs Jiggle #3DThursday #3DPrinting « Adafruit Industries – Makers, hackers, artists, designers and engineers! …Using a Sculpting Tool, VRClay allows you to freely sculpt with tools like buildup, pull, push, drag and others to your heart’s delight. The drool quotient is that it’s compatible with Oculus Rift. So the lucky guy in the video is using VRClay displayed on his Oculus Rift virtual reality headset. Razer Hydra compatibility sweetens the deal…and as you can see, the handheld Hydra motion controllers look like a nifty dance in motion. The whole nine yards of creating ‘something out of nothing’ is very exciting; it moves beyond just probing and prodding and into more immersive sculpting territory. 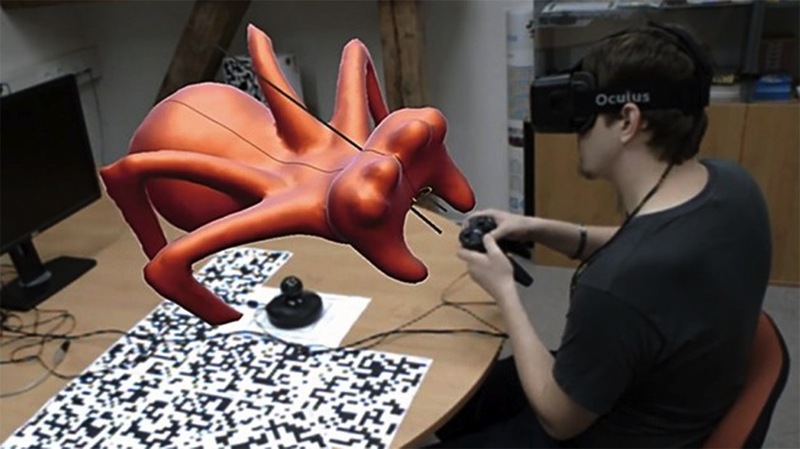 Really, it’s one of the more exciting forms of interacting with 3D data we’ve seen in a really (really) long time….